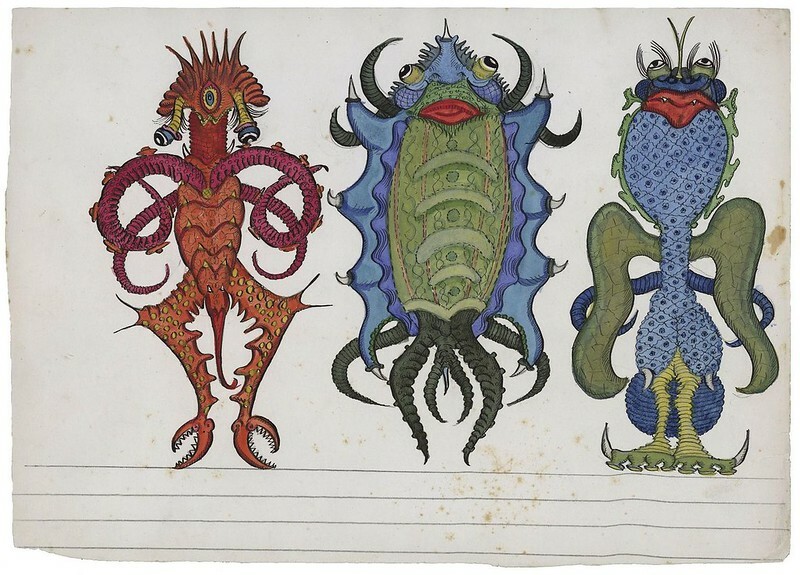 "Josep Baqué was born in Barcelona in the late19th century. 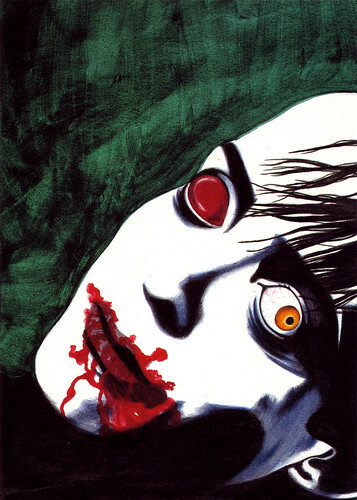 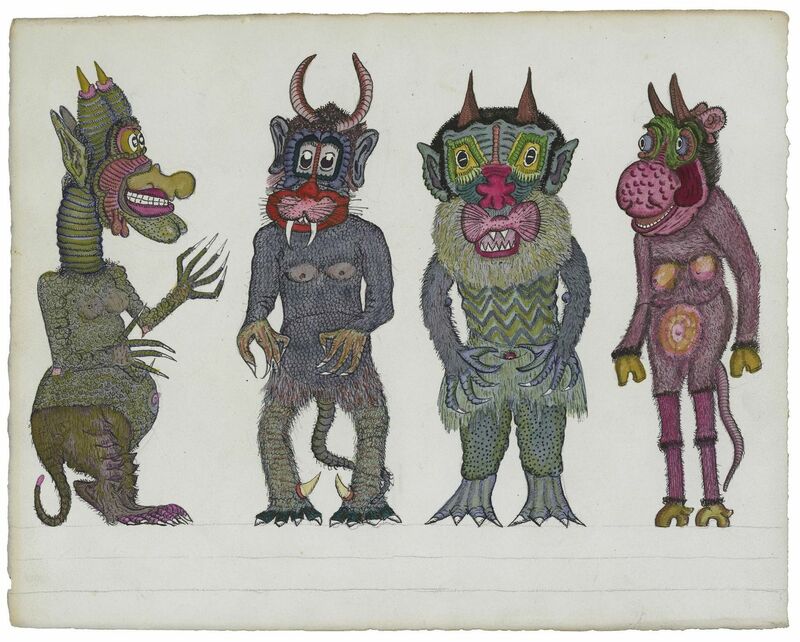 He was a municipal police officer and during his lifetime never declared himself as an artist. 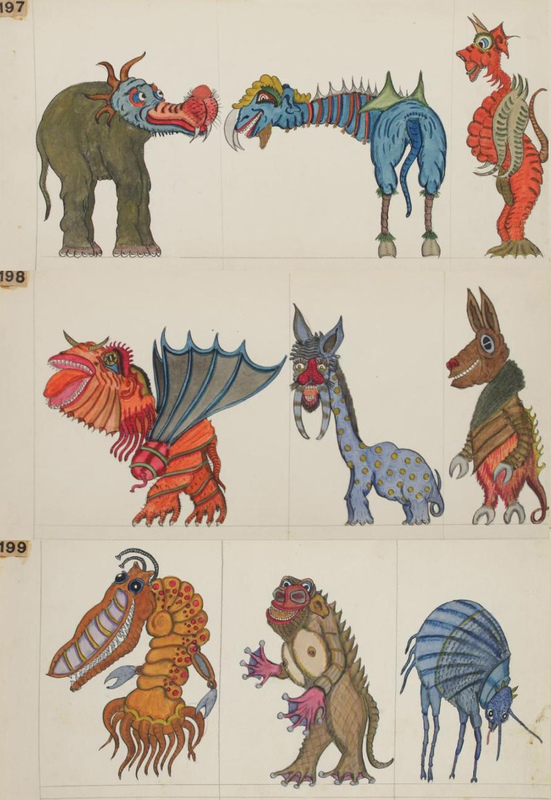 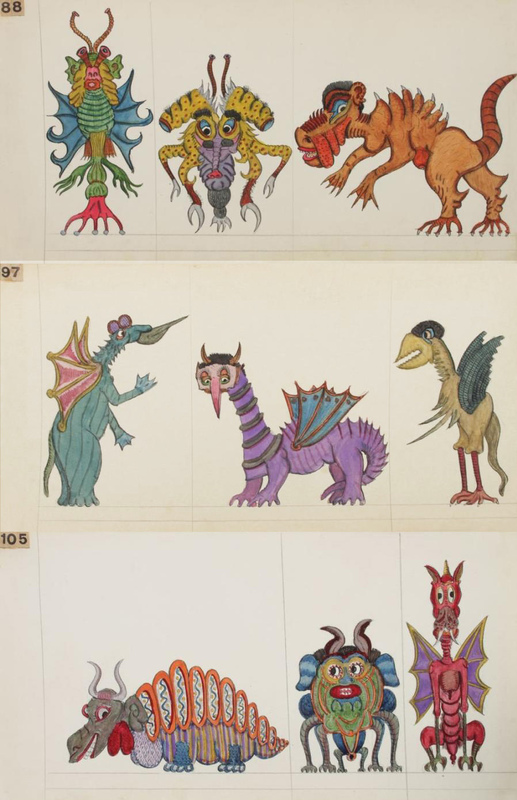 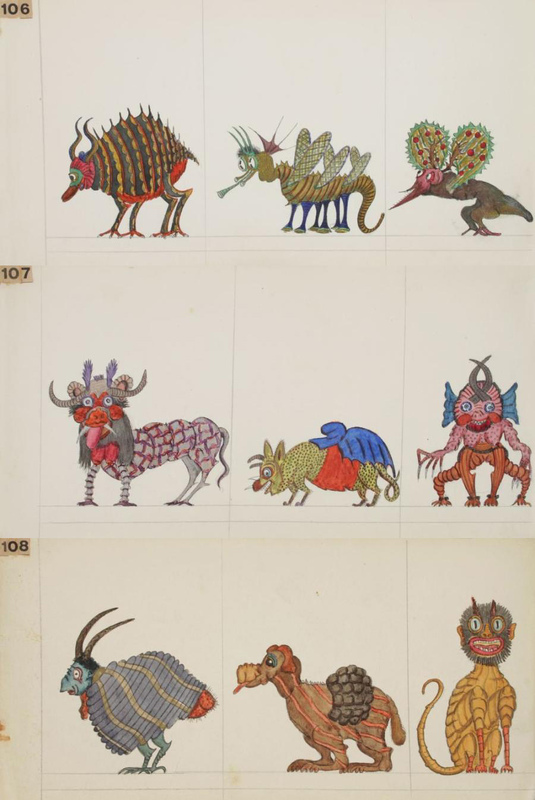 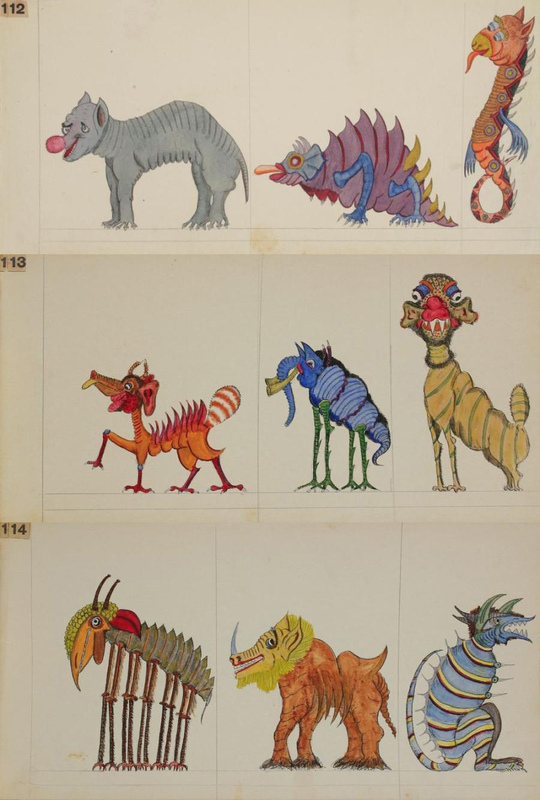 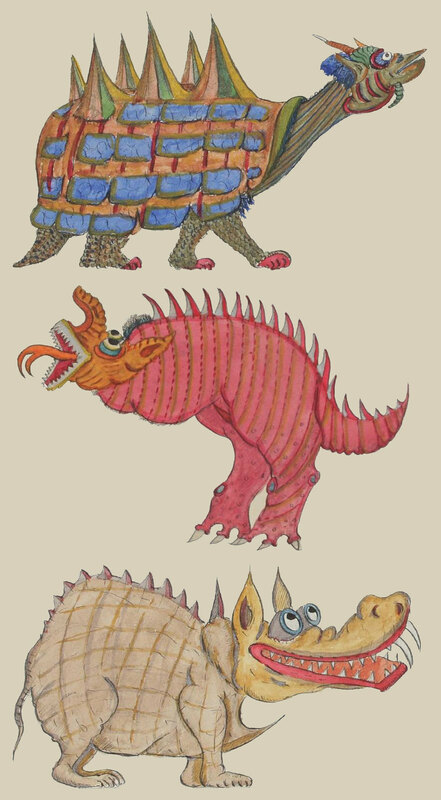 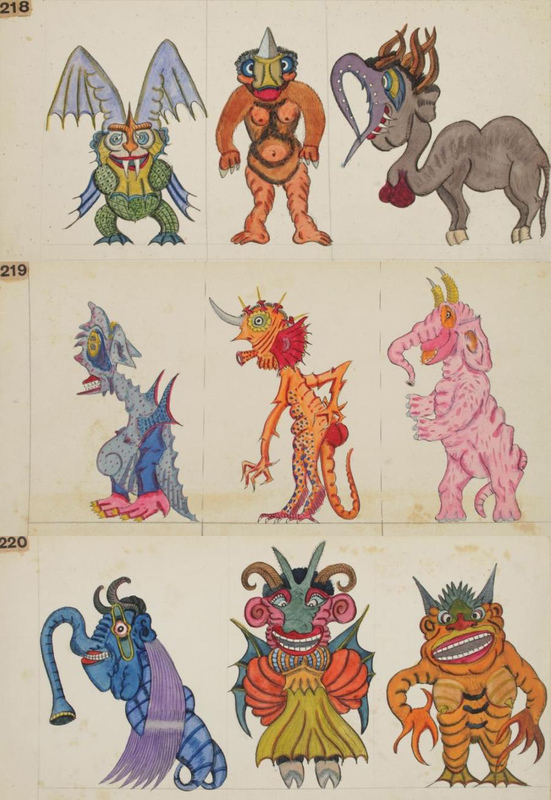 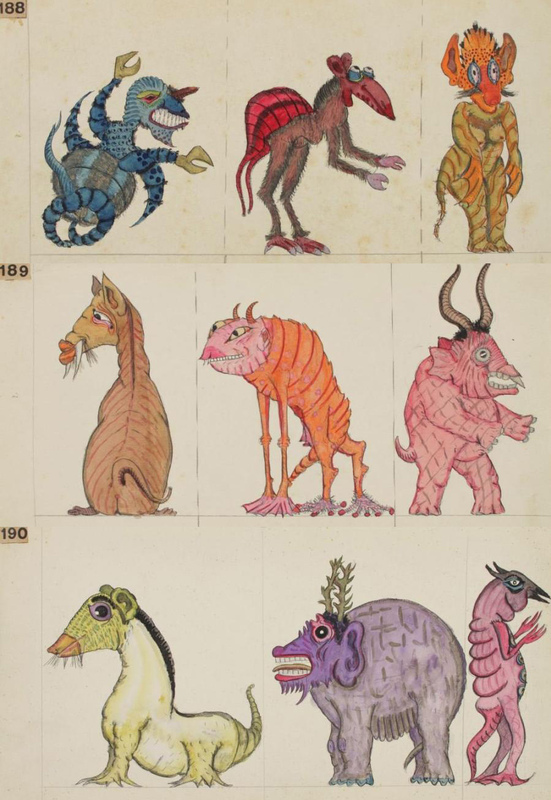 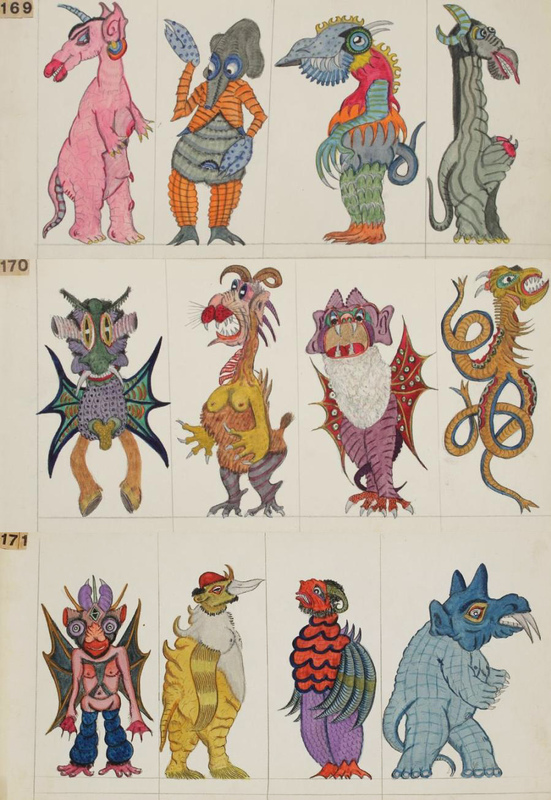 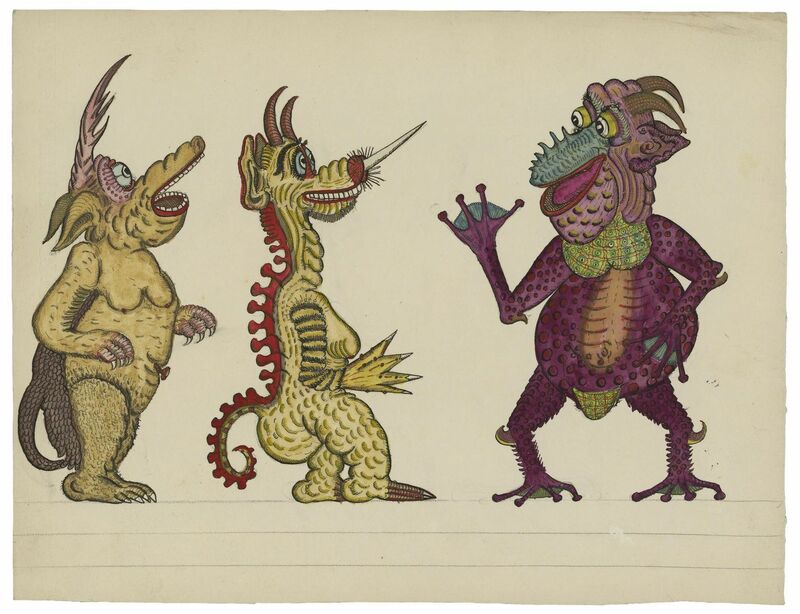 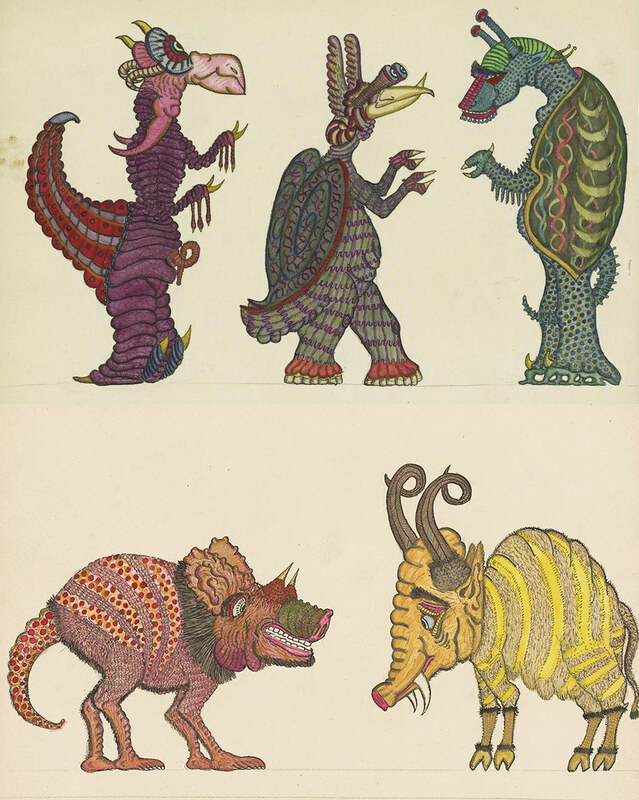 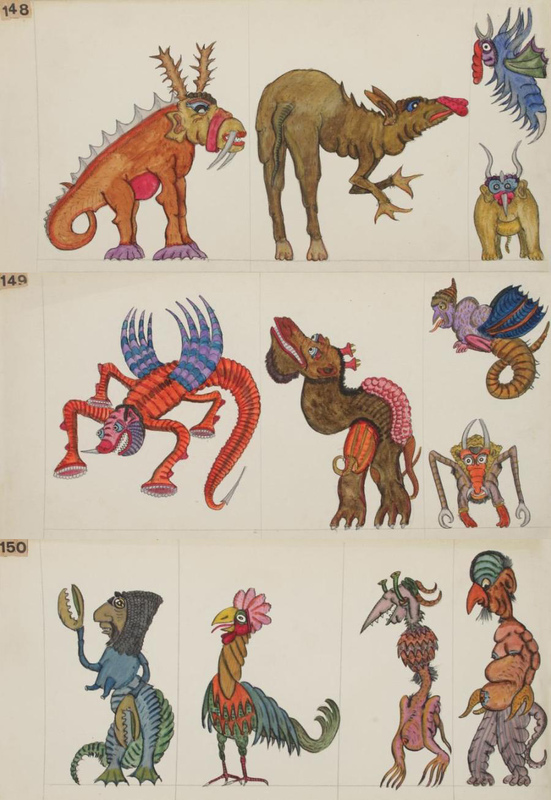 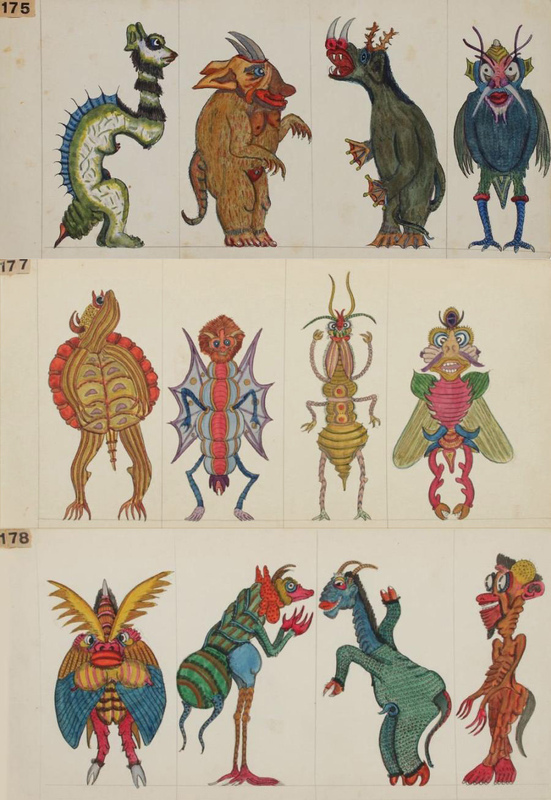 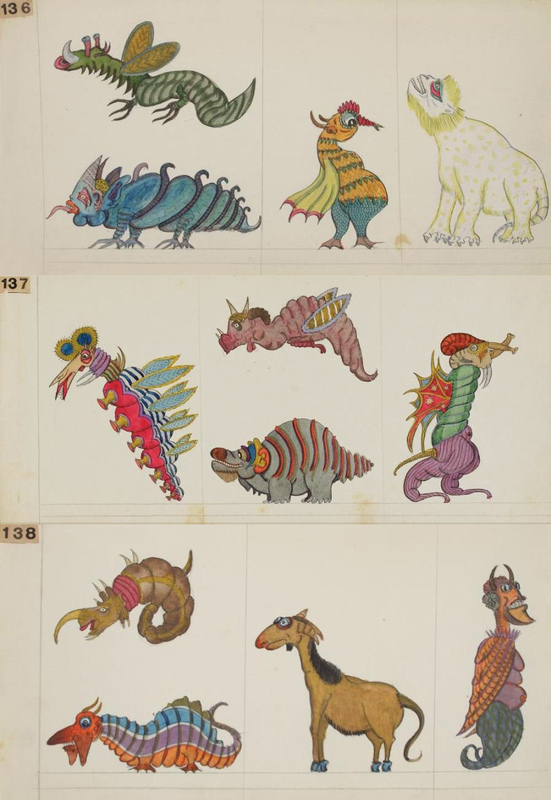 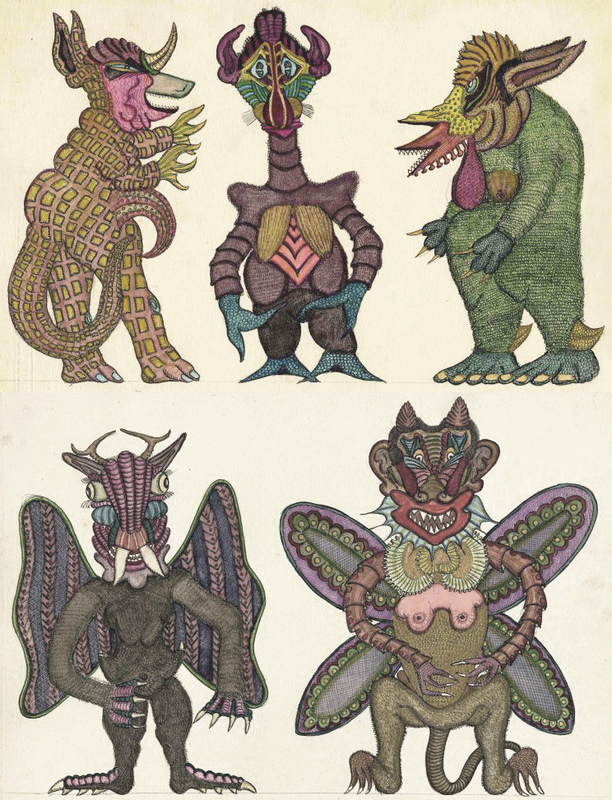 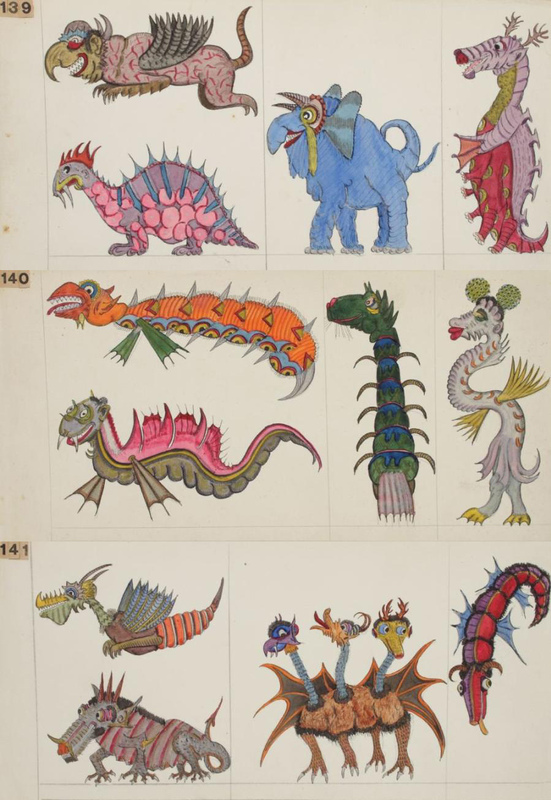 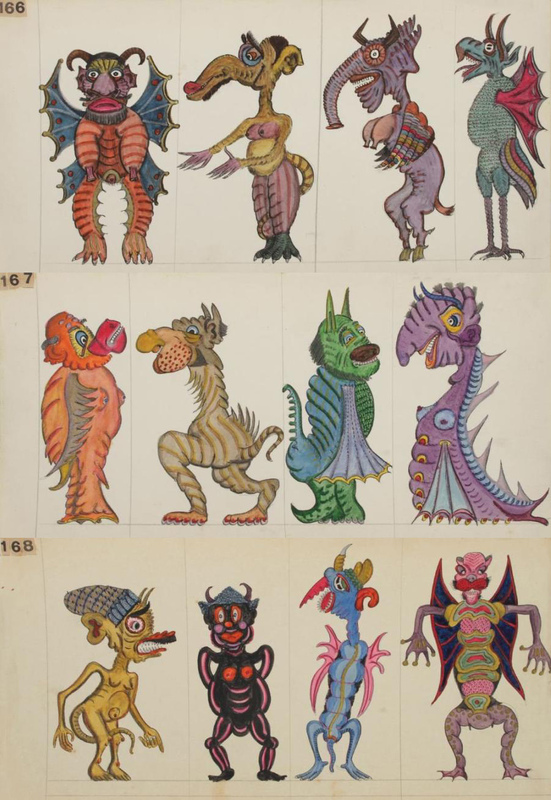 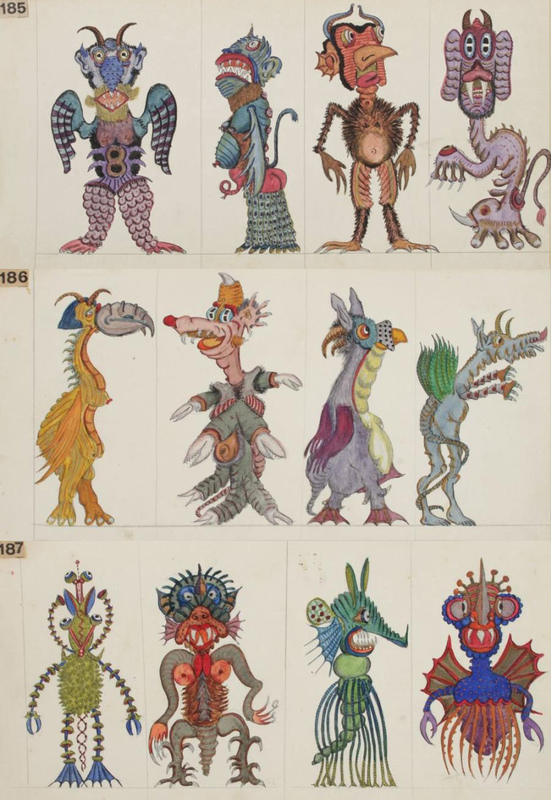 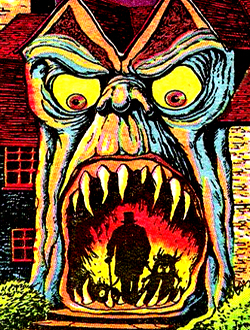 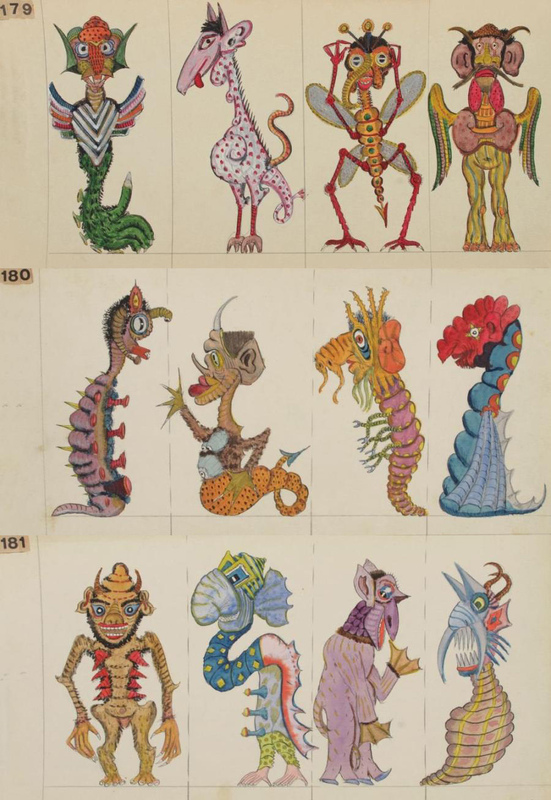 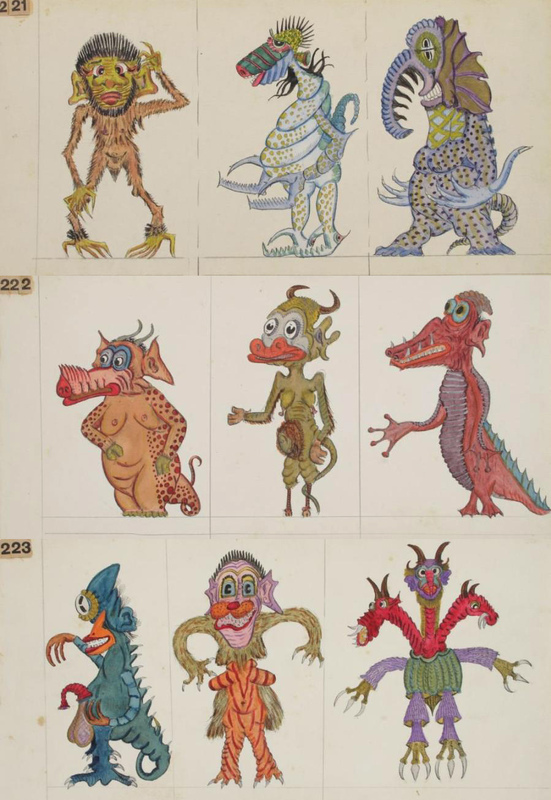 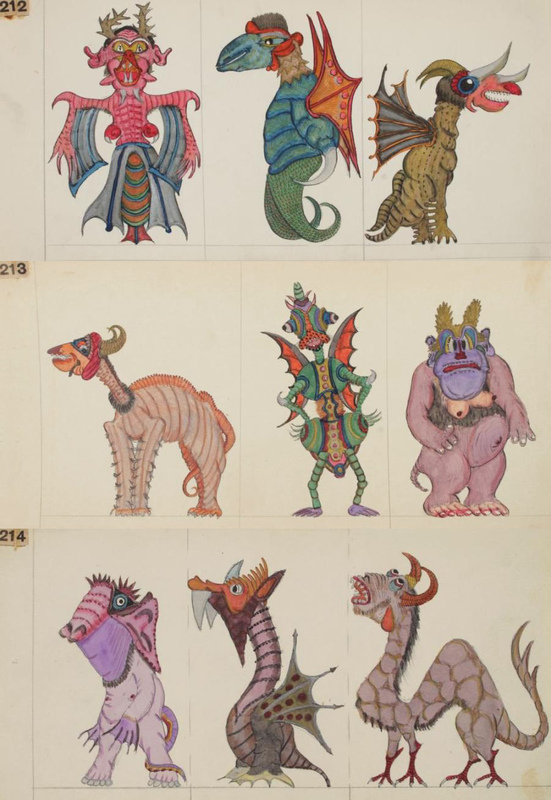 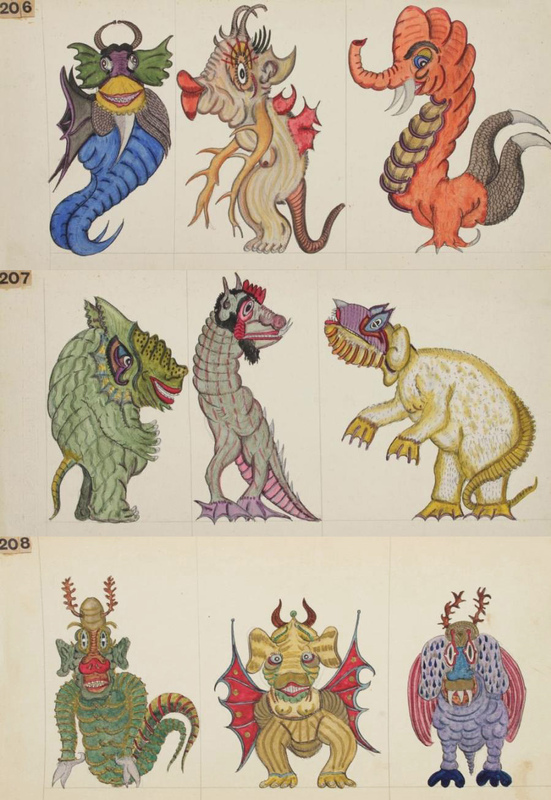 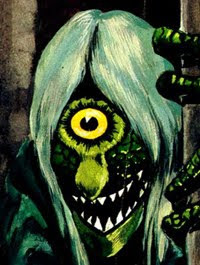 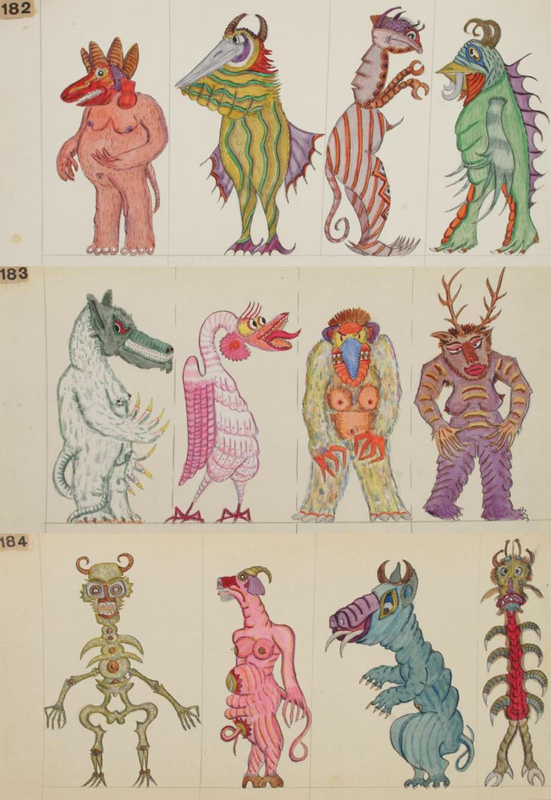 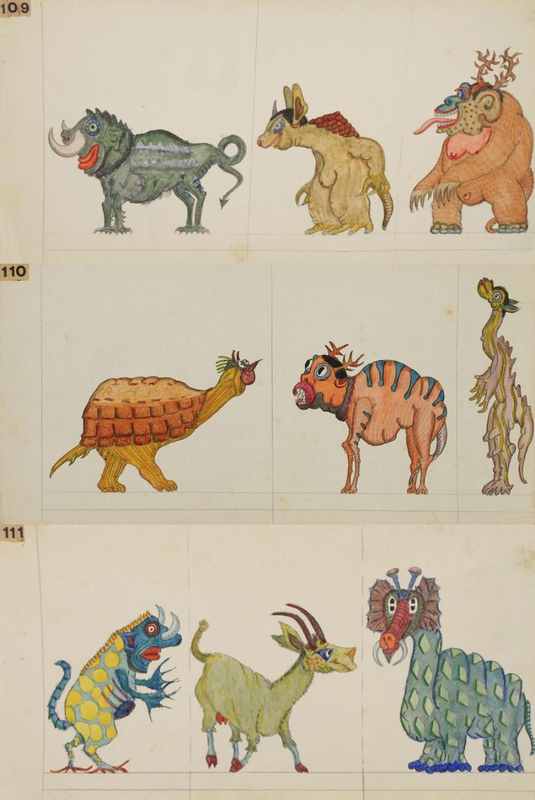 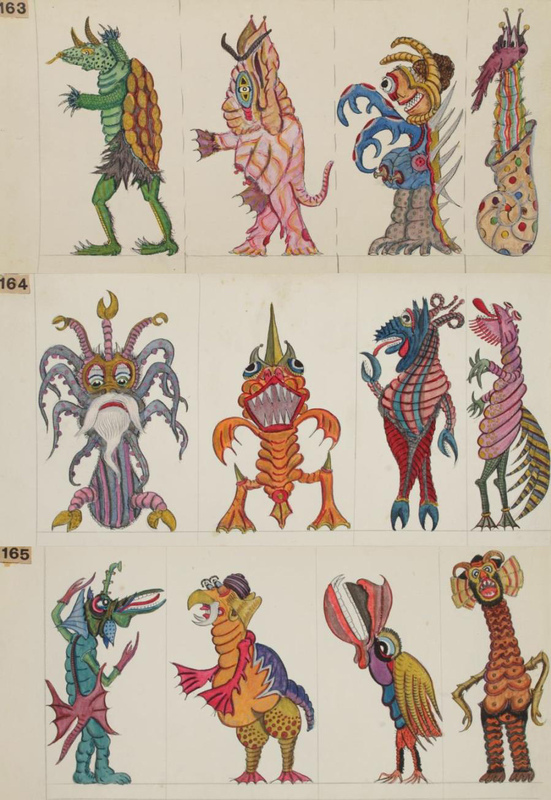 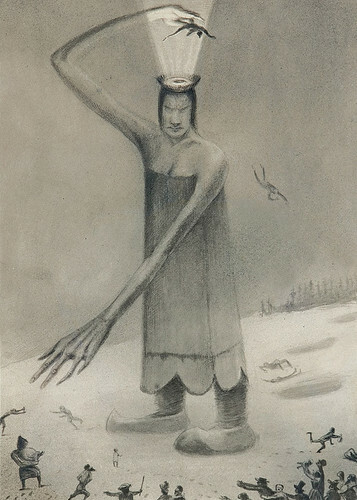 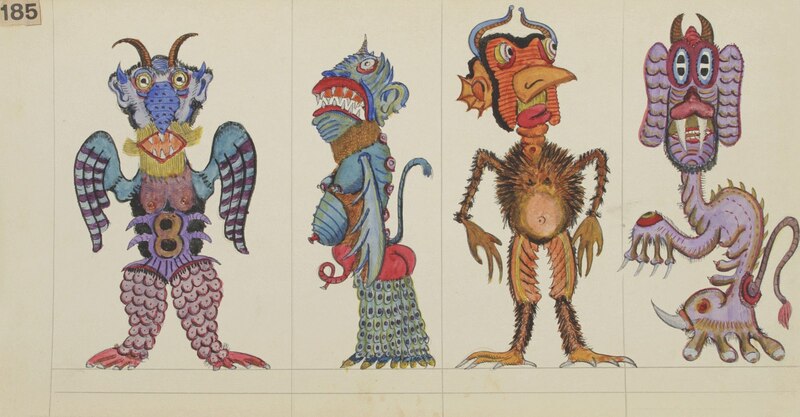 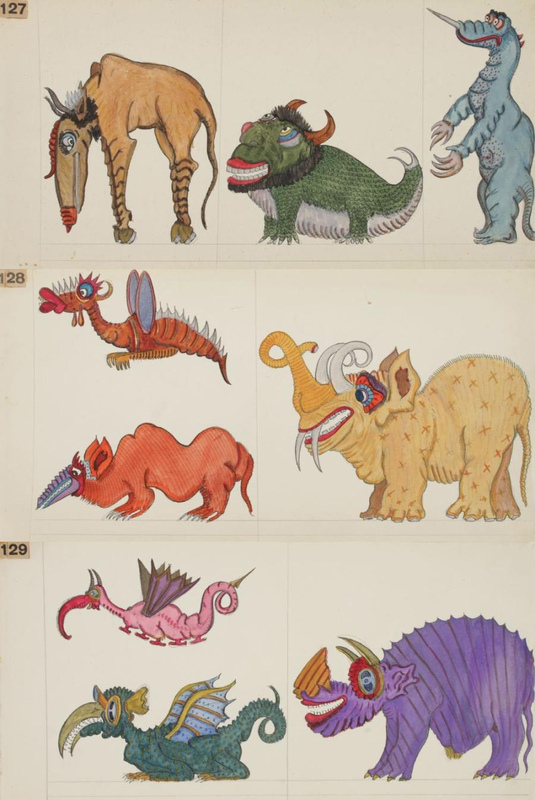 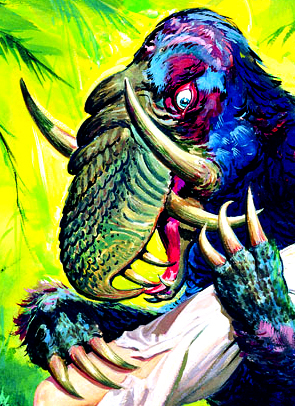 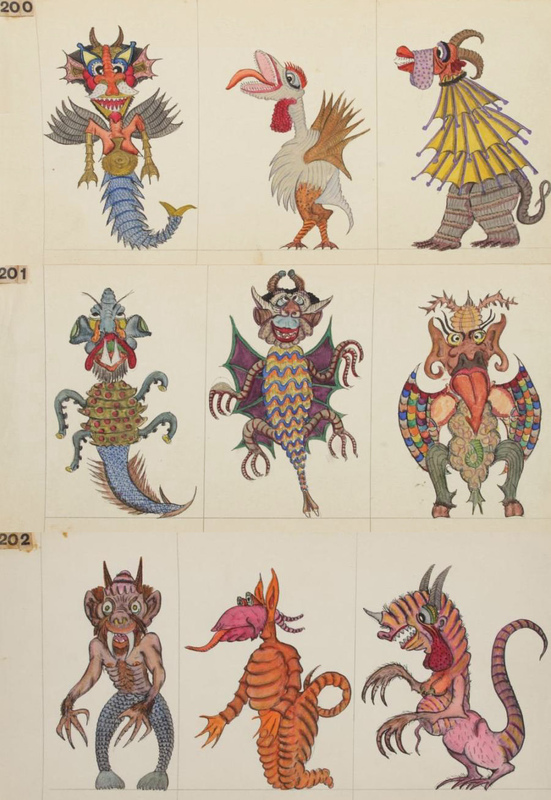 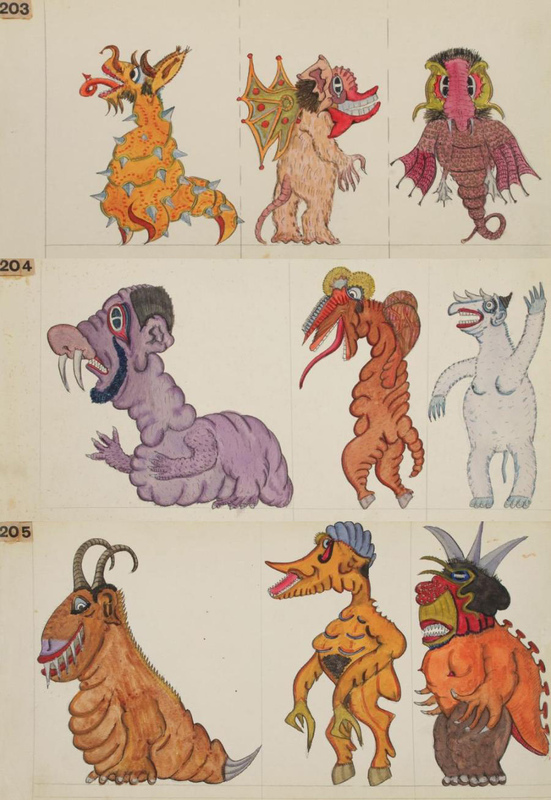 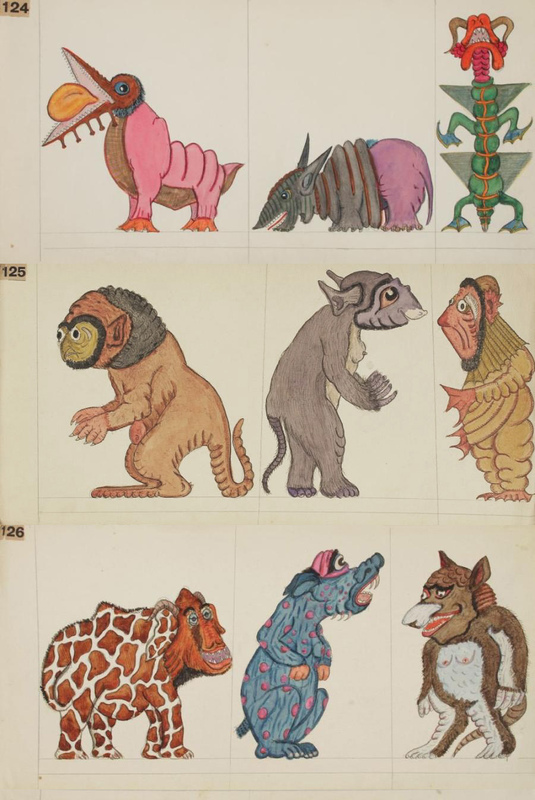 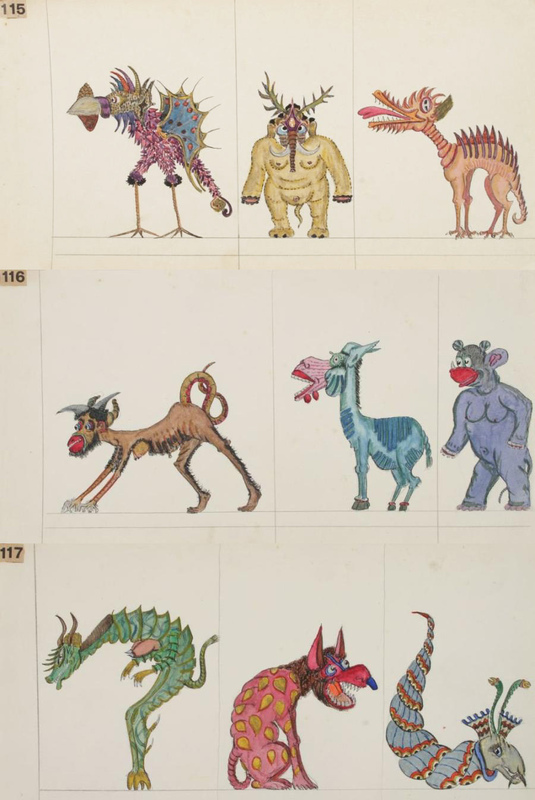 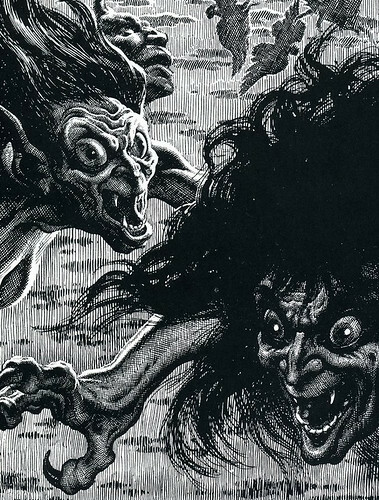 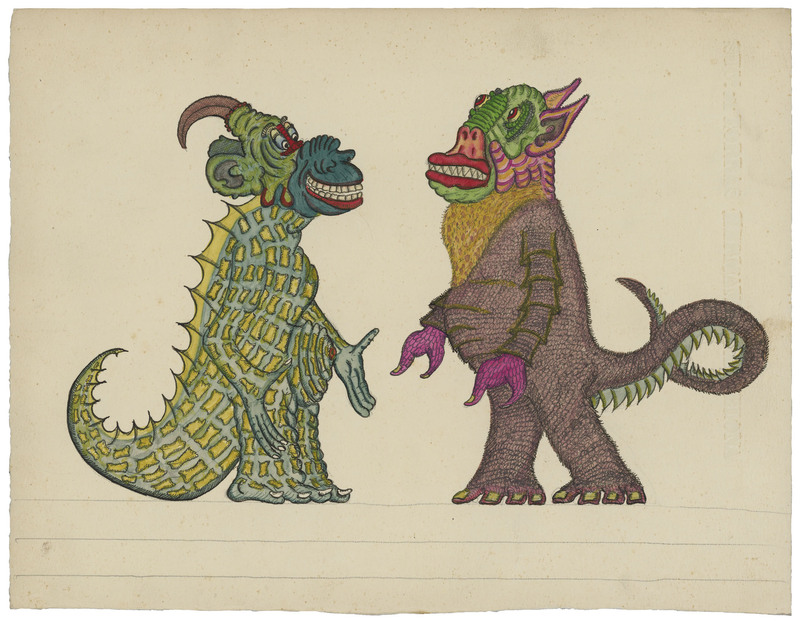 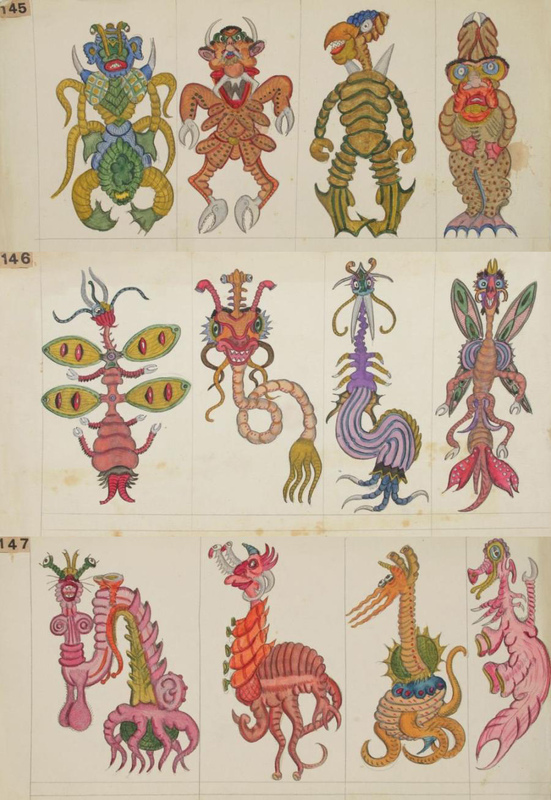 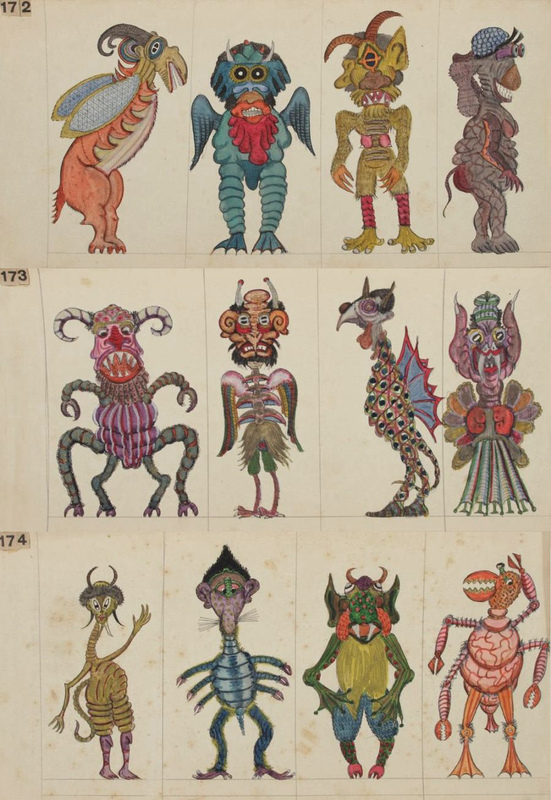 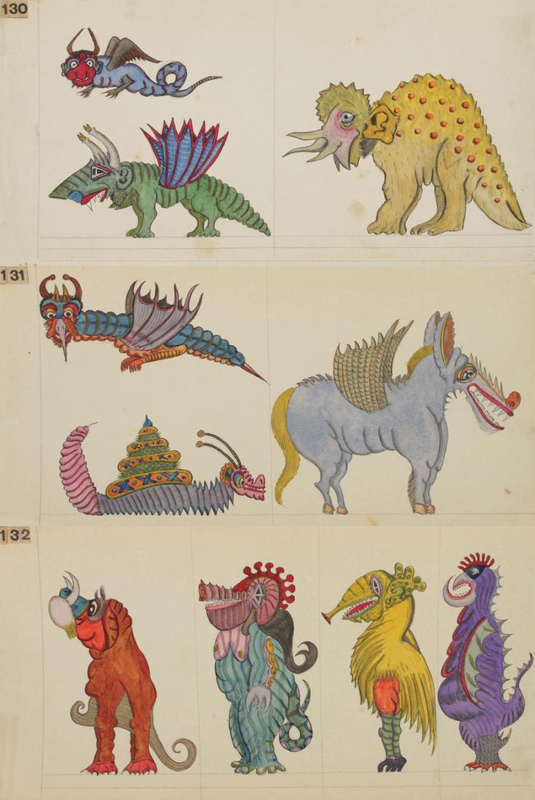 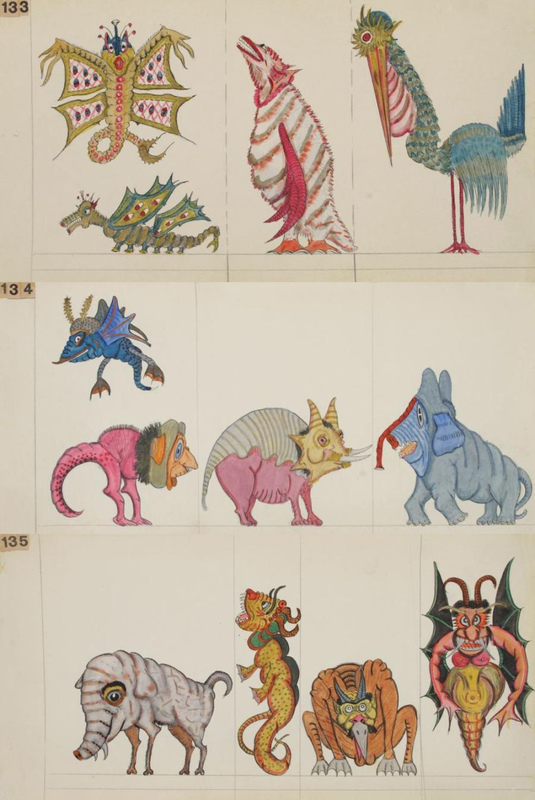 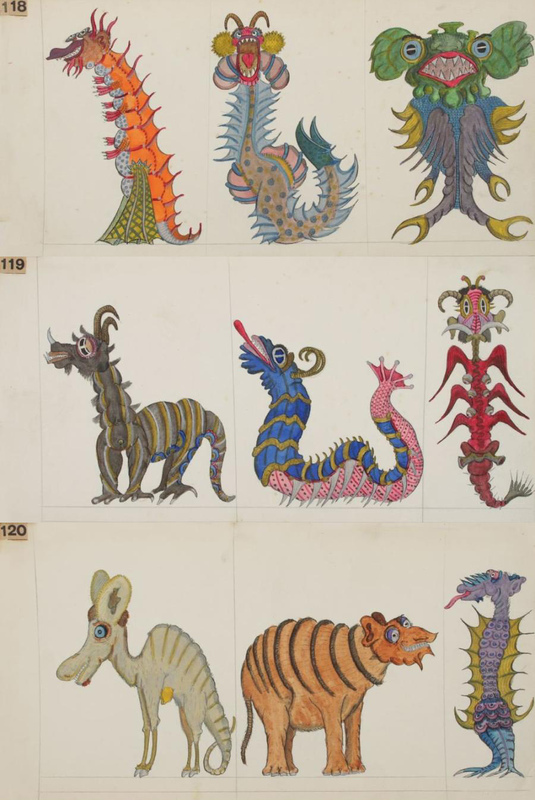 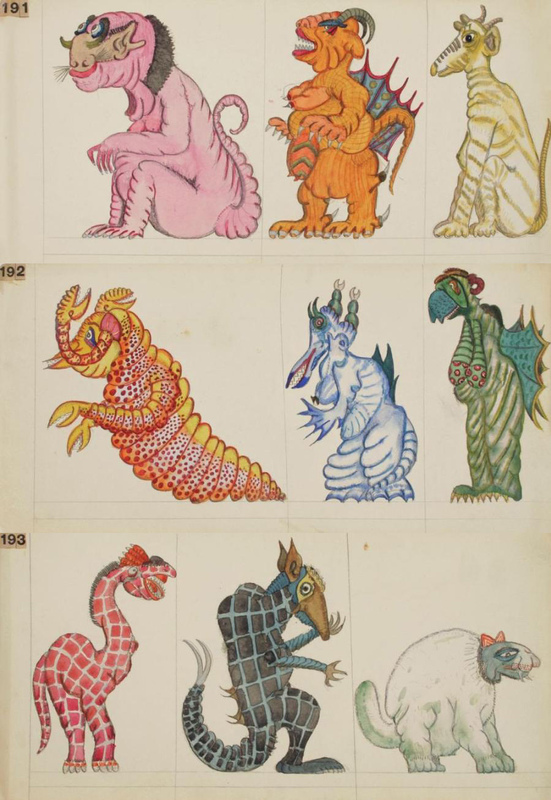 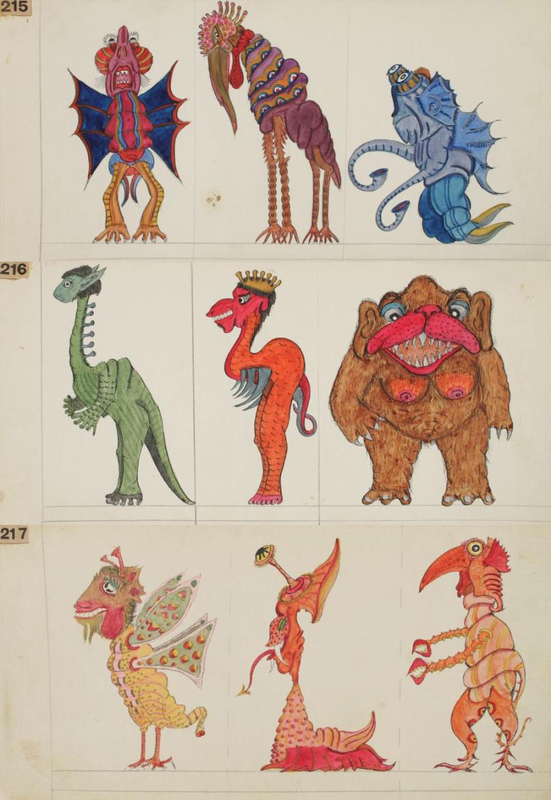 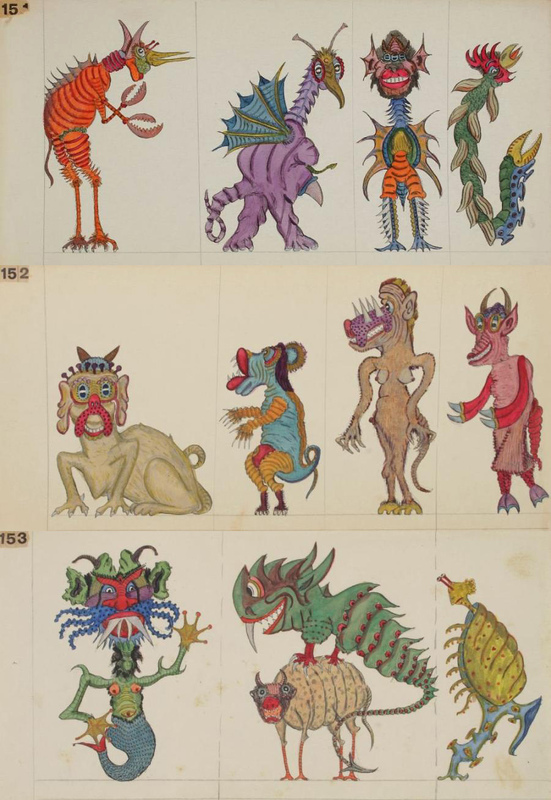 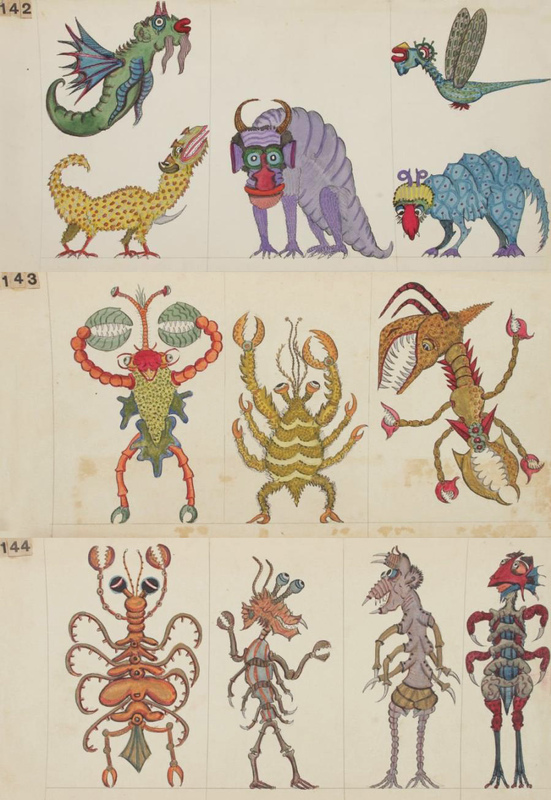 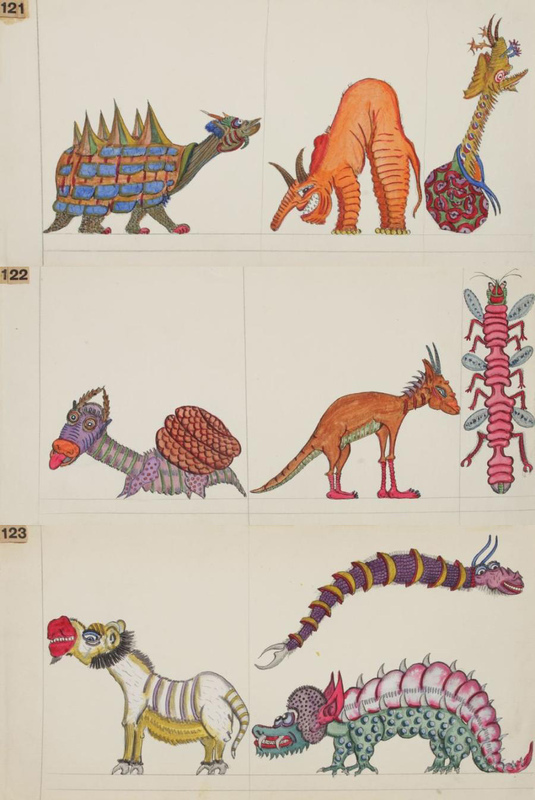 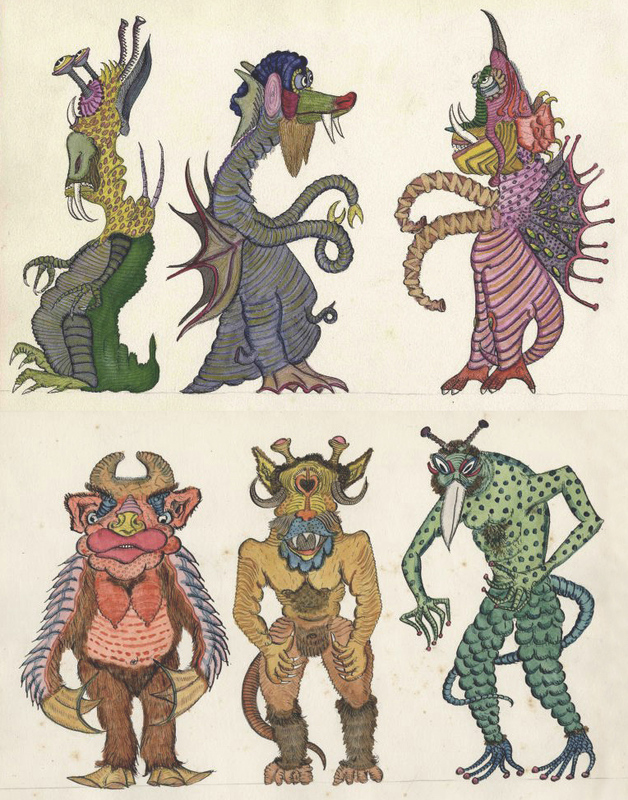 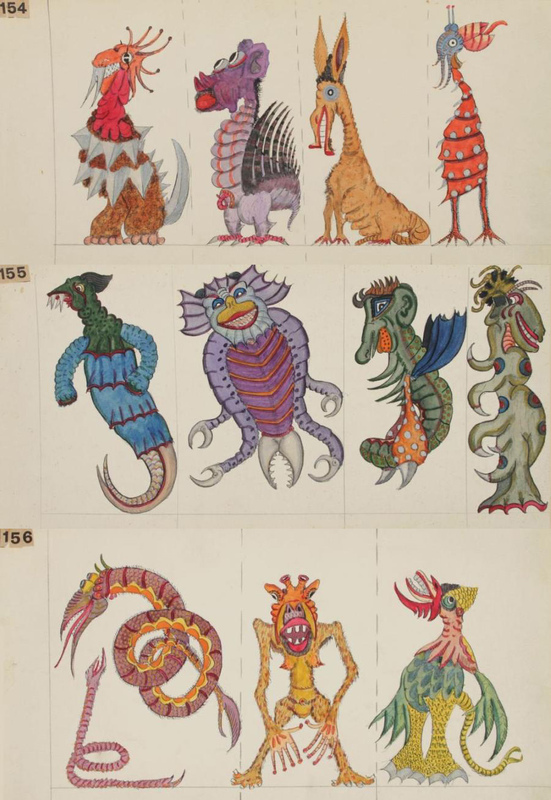 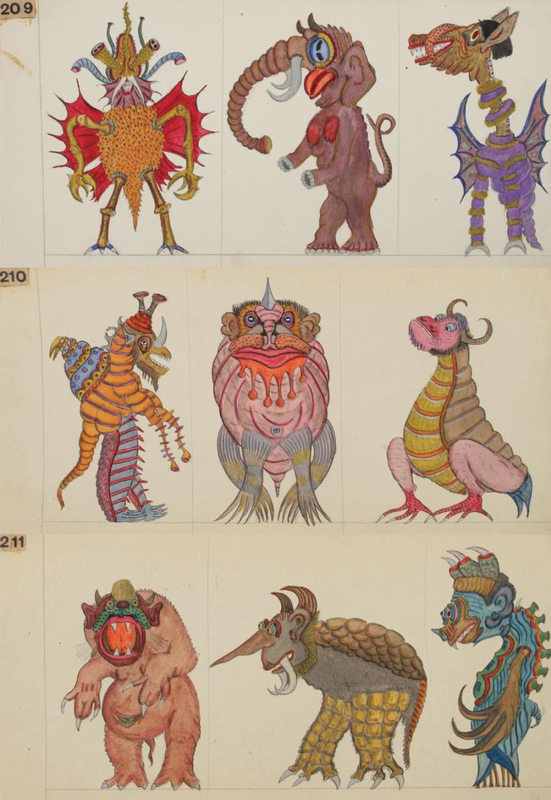 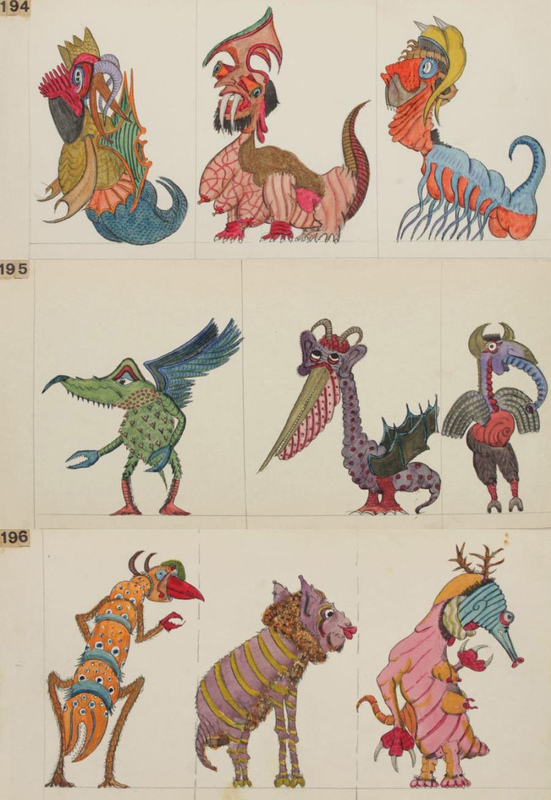 Since early 1930s and for the following decades he produced more than 1500 drawings of "monsters, wonders and rare events" made in ink and gouache on paper, some embellished with gold and silver. 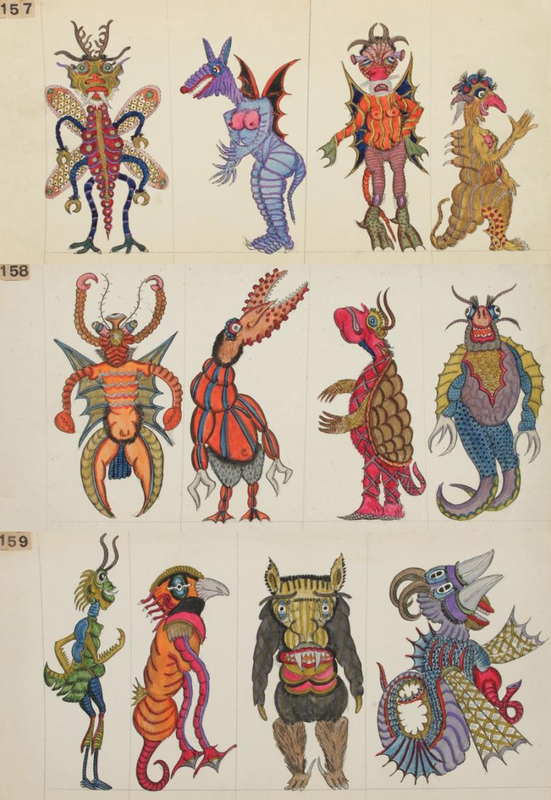 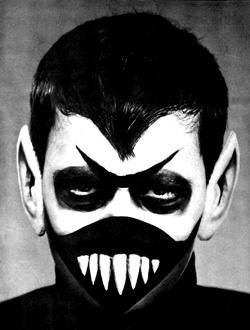 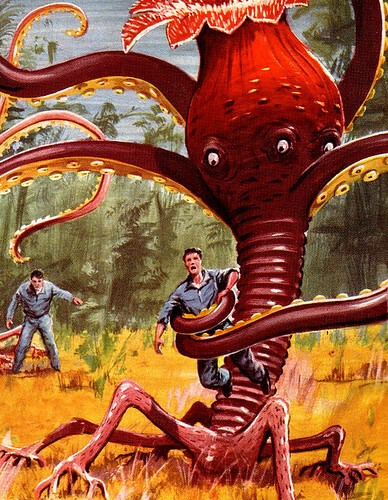 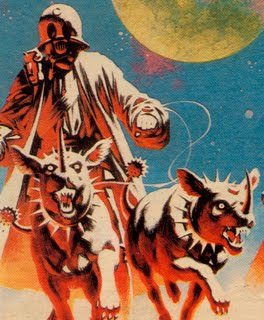 He created army of imaginary creatures, strange and unusual, mixing human and animal traits or characteristics of different types (cats, primitive men, bats and insects, giant spiders, snakes, snails, octopus, cuttlefish, seafood, fowl, fish...) Baqué died in 1967 and left his niece, his sole heir, his fantastic bestiary isolated away from light for nearly 40 years. 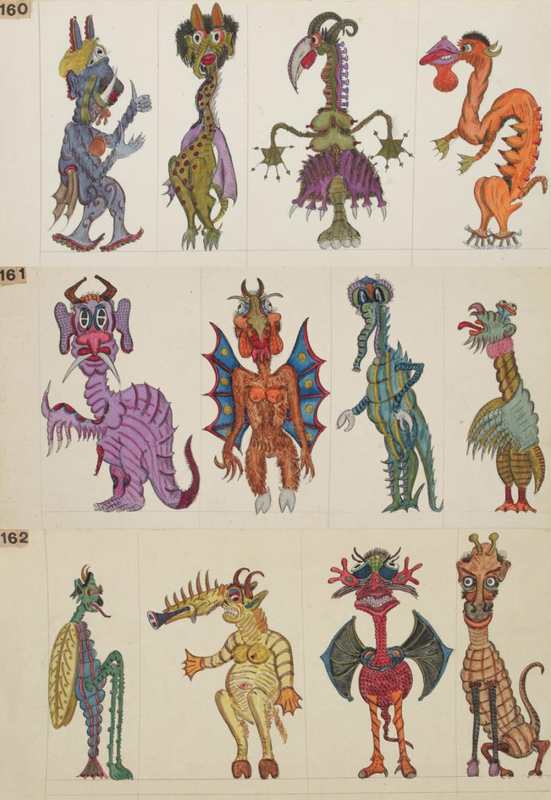 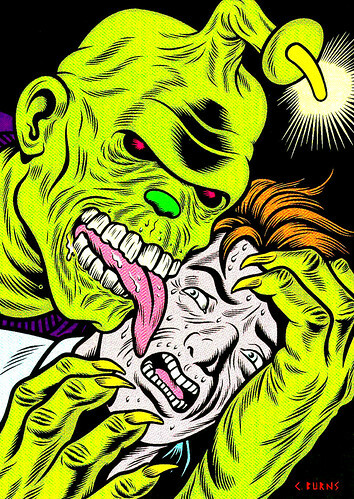 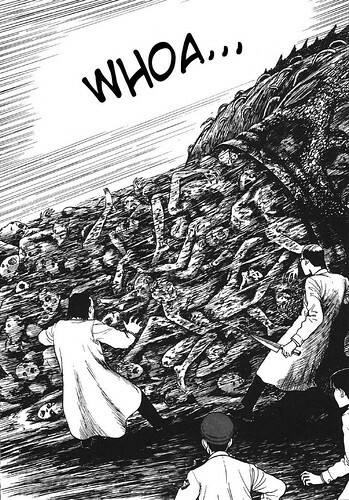 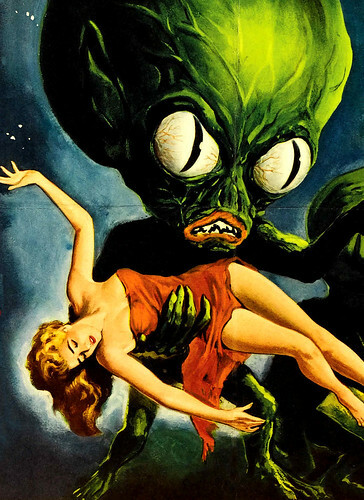 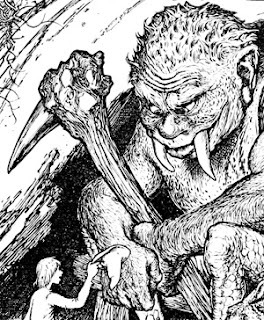 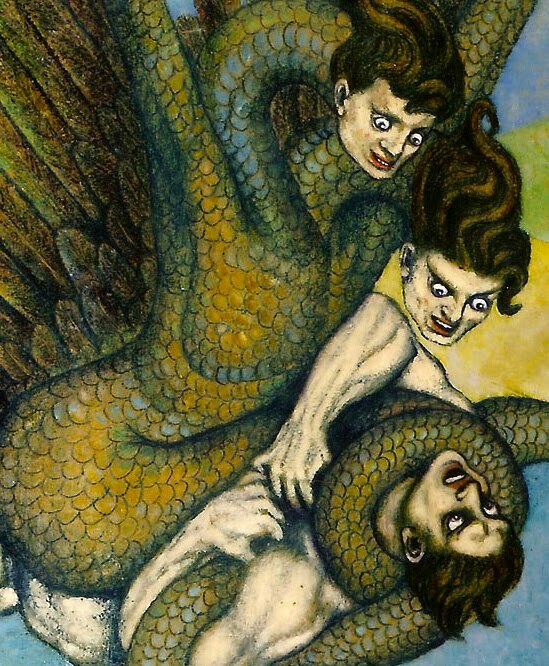 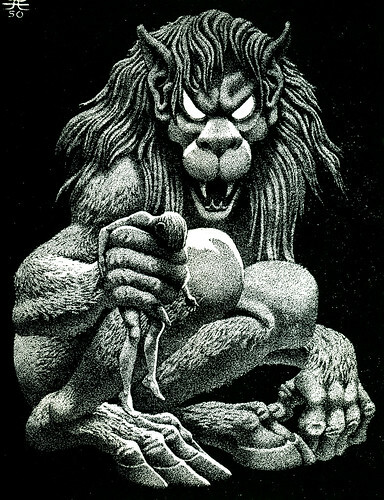 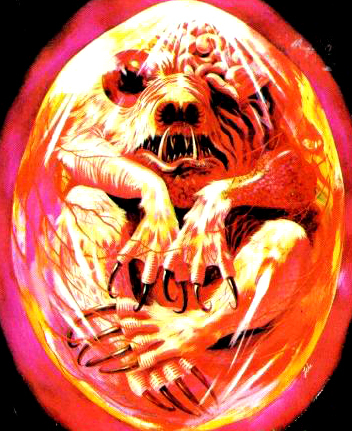 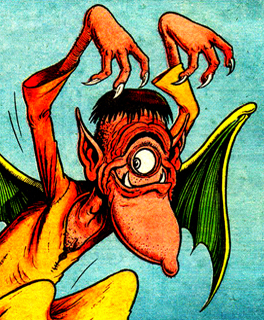 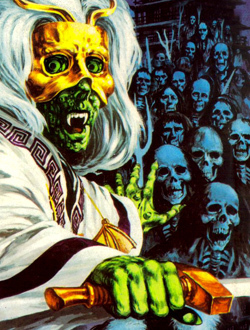 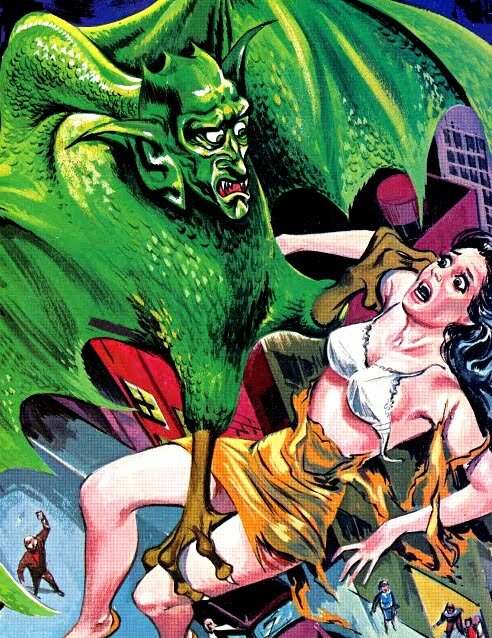 In 2007, the famous College of Pataphysics organized an exhibition of 160 monsters and published a lengthy article in the journal of pataphysicians Viridis Candela." 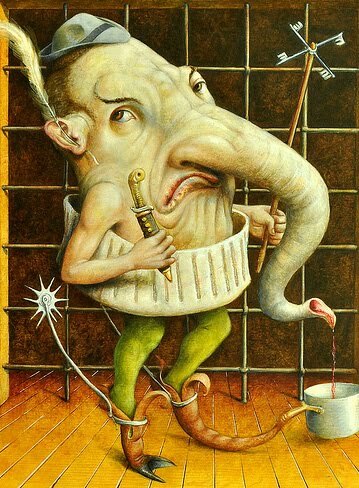 - quote source unknown Artworks found at Liberation Next Arts andAder Nordmann. 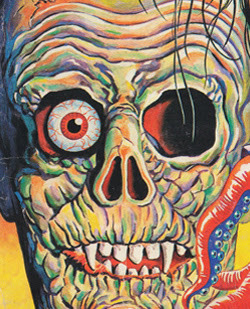 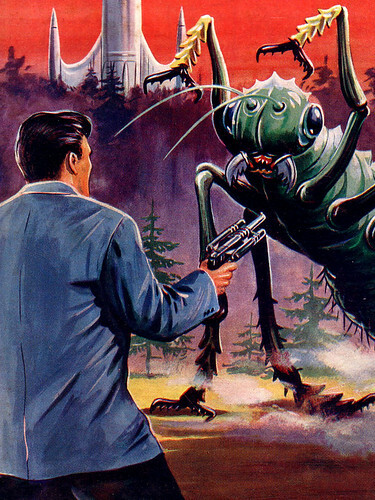 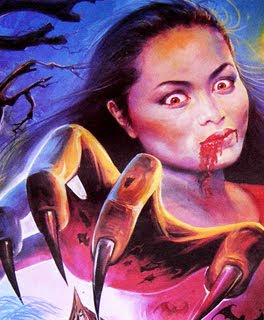 Artist found thanks to Dwey Guyen, check out his incredibly strange artworks here.